Social media monitoring platforms are undoubtedly one of the more desirable acquisition targets for both technology, e-commerce and media companies. Salesforce picked up Radian6 a few weeks ago for $326 million and Walmart bought Kosmix as well. And today IAC-owned local media and advertising property CityGrid Media is acquiring its own social media monitoring and sentiment analysis platform, BuzzLabs. Financial terms of the deal were not disclosed. Seattle-based BuzzLabs, which was co-founded in 2009 by former Microsoft employees Philip Lee and Dou Shen, allows publishers to leverage social content, keeps consumers better informed, and helps local businesses monitor their presence across the web. BuzzLabs’ dashboard for businesses dashboard aggregates social media activity into one location, allowing companies to track mentions, Tweets, reviews and more across the web. For content providers, BuzzLabs will help socialize data. For example, BuzzFeed’s opinion mining technology extracts and identifies key phrases from content to determine if it’s positive, neutral, or negative. The startup also creates tag clouds from content. The company has actually been a partner of CityGrid and has been using the local media platform’s API for the past year. So how does BuzzLabs’ technology help CityGrid? For background, IAC launched CityGrid last year as a set of APIs which makes all of Citysearch’s local listings content and advertising available to other Websites and mobile apps. The company then rebranded its Yelp-like local business content platform CitySearch as part of CityGrid Media. All of the local listings in Citysearch are available through CityGrid’s APIs so that anyone creating a mobile app or local Website can grab business listings, addresses, phone numbers, photos, reviews, and more and build their own apps around them. CityGrid also matches local advertisers with these local publishers. With the acquisition, CityGrid says it will have the ability to aggregate and analyze millions of pieces of content across its content and ad network, including reviews, articles, blog posts, check-ins, Likes and other real time streams of user generated content, producing additional data relating to business sentiment, consumer insight and trending data for its publishers and million-plus merchants. The acquisition will also offer a reputation management and social media monitoring platform to local merchant advertisers. 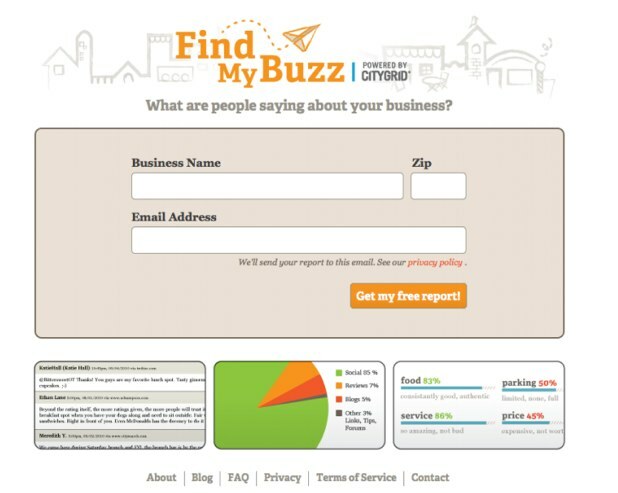 And the BuzzLabs business dashboard will be integrated into the CityGrid Media Ad Center, allowing local merchants to access BuzzLabs’ social monitoring and analysis tools to better manage online reputations. Herratti tells us that BuzzLabs technology will be integrated into the CityGrid platform over the next three to six months.